Epic Arkansas Roadtrip Itinerary on US 82 from Texarkana to Lake Village. Explore Lower Arkansas on a great stretch of highway, affectionately referred to as Arkansas's Bandit Gambit. 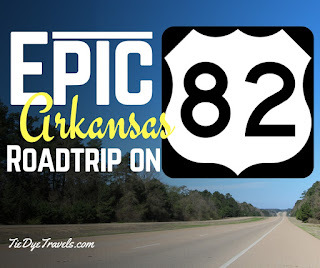 Find out what US Highway 82 between Texarkana and Lake Village has to offer with this great itinerary. Many of us recall the popular movie Smokey and the Bandit, starring Burt Reynolds, Sally Fields and Jackie Gleason. Do you remember where it all began? Texarkana! And the route that took the Bandit to his destination was indeed US Highway 82. There's a lot to see and do along Arkansas's stretch of blacktop. Here's an itinerary - which I suggest you undertake at a somewhat slower speed, so you can enjoy the sights. Arrive and enjoy an afternoon exploring all this famed railroad town has to offer. Spend an hour or two at the Four States Auto Museum. Cash and Elvis Presley once performed (tours only by request). Grab your photo op at the State Line. Celebrate the city's rail history by checking out all the cool tiny trains at the Lindsey Railroad Museum. Restaurants: Dine at Cattleman's Restaurant for steaks and animal parts, Old Tyme Burger Shop for great burgers and fried pies, or Hopkins Icehouse for upscale eats. Stay at: One of the great hotels in the new Arkansas Convention Center complex (I dig the Hampton Inn Texarkana, but have also had great stays with the Comfort Suites and Holiday Inn). Cross the Red River at Garland City. 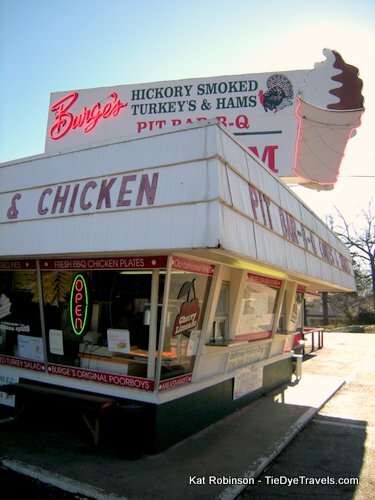 Have lunch at Burge's in Lewisville, where you can enjoy the famed smoked turkey that put the town and family on the map or dive into a banana split. See if you can find Waldo (hint: it's a town on the old US 82 alignment). Not much to see at the moment, but hopefully the Reader Railroad will ride again (I have fond memories of that train). Drop in and shop at Lois Gean Fashions, one of the South's most respected clothiers, in operation since 1948. View the marvelous murals around Magnolia's downtown square, and shop at the quaint retailers that surround the county courthouse. Grab cookies at Magnolia Bake Shop. Head out to Logoly State Park and learn more about the uniqe environment of the area, as well as efforts to preserve it. The new LEED-certified visitors center gives all comers the chance to see, hear and even smell nature. Stay downtown at the Loft on the Square for more upscale accommodations. Magnolia also has a pretty solid Hampton Inn. Have dinner at The Backyard Bar-B-Q Company. Don't forget to get a slice of pie. Boomtown re-creation and tinkering studio. Lunch at Johnny B's, a sweet 50s style diner full of Coca-Cola memorabilia. Check off another state park and learn all about trees in Lower Arkansas at the South Arkansas Arboretum. 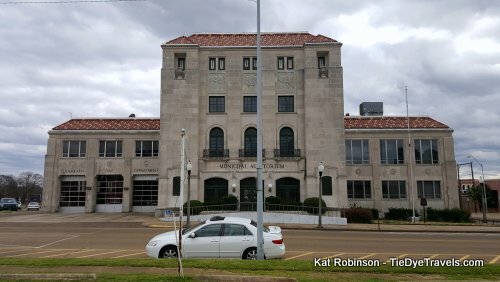 Take a walking tour of downtown El Dorado. Have dinner at Fayray's for an upscale experience, or knosh lightly at PJ's Cafe and follow it with a cold bite at the El Dorado Creamery. Catch a live musical or comedy show at the gorgeously restored Rialto Theater. Stay at the phenomenal Union Square Guest Quarters to get a really good feel of the downtown area. If you're looking for something outside of downtown, I can highly recommend the Hampton Inn. Missed your Spudnuts in Magnolia? Pick up a dozen. Head out across to Crossett and enjoy a stroll in the park. Consider exploring the Felsenthal Wildlife Refuge. Explore Lake Chicot State Park. Dine at JJ's Cafe or The Cow Pen. Find Ms. Rhoda Adams driving around Lake Village and get a coffee can full of tamales. Visit the Arkansas Welcome Center with its unusual multi-layered deck on Lake Chicot, the world's longest oxbow lake. Highway 82 Bridge, the longest cantilever bridge across the Mississippi River. Marlon Brando didn't make the cut for the cinematic masterpiece known as Smokey and the Bandit. I believe you must be referring to Jackie Gleason. Grav and I were arguing about that. Heh, what a mistake.